K/PV’s Dylan Rooney puts a shot on Sleepy/Irvington keeper Matt Lipsky. PUTNAM VALLEY—The Kennedy Catholic/Putnam Valley high ice hockey team got a win Sunday, beating Somers/North Salem, 4-2, but Friday Kennedy/Put Valley lost its first … Please login below or purchase a subscription to the Putnam County Courier to access this content. BREWSTER—Sean Trainor dropped 26 points on the Hornets of Lakeland Saturday afternoon, leading the Brewster High boys basketball team to a 63- 51 victory in the championship game of the Panas tournament. … Please login below or purchase a subscription to the Putnam County Courier to access this content. Carmel’s Marie Mullen led the Rams with 13 points last Thursday in Carmel’s first-ever win over Lourdes. CARMEL—The Carmel High girls basketball team reached a milestone— of sorts—last Thursday when the Rams notched thei… Please login below or purchase a subscription to the Putnam County Courier to access this content. 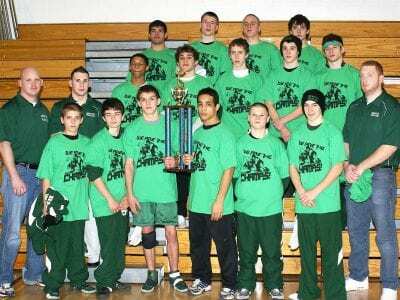 The Brewster High wrestling team won the North County duals last weekend at Yorktown HS. BREWSTER—The Brewster High wrestling team came up with a clutch performance at last weekend’s North County Dual Meet Tournament at Yorktown High Scho… Please login below or purchase a subscription to the Putnam County Courier to access this content. 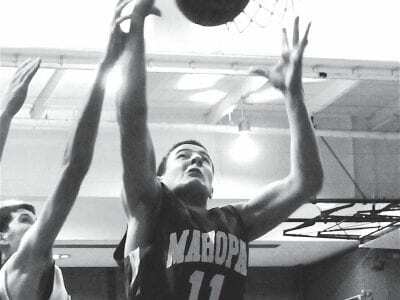 Chase Thompson led Mahopac with 13 points in a loss to John Jay. MAHOPAC—The Mahopac High boys basketball team dropped a league game to visiting John Jay-East Fishkill, 47-39, Thursday night to drop its record to 1-4. Senior forward Chase Tho… Please login below or purchase a subscription to the Putnam County Courier to access this content. BREWSTER—It wasn’t what the Brewster hockey team did against Somers/North Salem that cost the Bears the game, it was what they didn’t do. … Please login below or purchase a subscription to the Putnam County Courier to access this content. CARMEL—The Carmel High wrestling team finished in second place at last Saturday’s Cornwall Dual Meet Tournament, and Rams coach Bill Twardy wasn’t complaining about the runner-up status. “I have to be happy,” Twardy s… Please login below or purchase a subscription to the Putnam County Courier to access this content. CARMEL—After picking up their first win last week the Carmel hockey team fell back into their old habits in a 4-1 loss at Trinity/Pawling on Friday. With the loss the Rams now stand at 1-4, with all games coming against league opponents. … Please login below or purchase a subscription to the Putnam County Courier to access this content. CARMEL—Aaron Smith had 12 points and Mike Rooney and Ryan Shilling each added 11 for the Rams, but it wasn’t enough, as the Carmel High boys basketball team dropped a 63-54 decision to John Jay of East Fishkill in a non-league game last … Please login below or purchase a subscription to the Putnam County Courier to access this content.